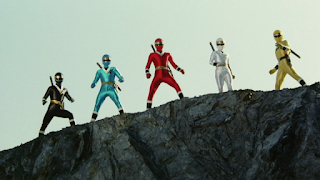 In celebration of the release of Ninja Sentai Kakuranger: The Complete Series by Shout! Factory, I have decided to dedicate a post to take a look at every Yokai that appeared in the series. I've talked about Kakuranger one or two times in the past, but after just finishing this DVD set I feel the urge to put out yet another post. 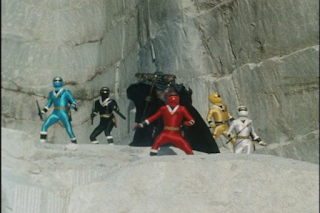 Kakuranger is my favorite Super Sentai after all. Quick shout out to...umm...Shout! Factory. So far they have put out three quality Super Sentai series on DVD in the US. I really hope that they continue on forever...but only time will tell. Thank you so much, Shout! Oh yeah, you did read that right earlier. 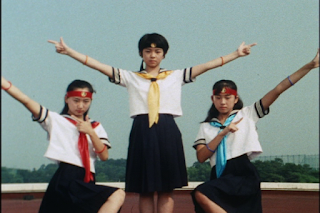 I have already finished watching my brand new Kakuranger DVD set despite the series not being officially released until just now. If you order from Shout! directly, you will get your copy more than two weeks early. I totally recommend pre-ordering new shows directly from them even if it costs a few dollars more. 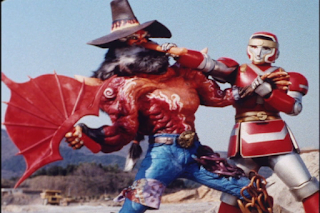 If it helps the cause for more Sentai getting a DVD release, then I'm all for it. These lists will take all things into consideration (design, use, episode quality). I don't want to just limit myself to design here, though I feel like there may be a connection between some of the weaker stories and Yokai designs...if that makes sense. So how about we go backwards and start with the worst? Hahahaha. 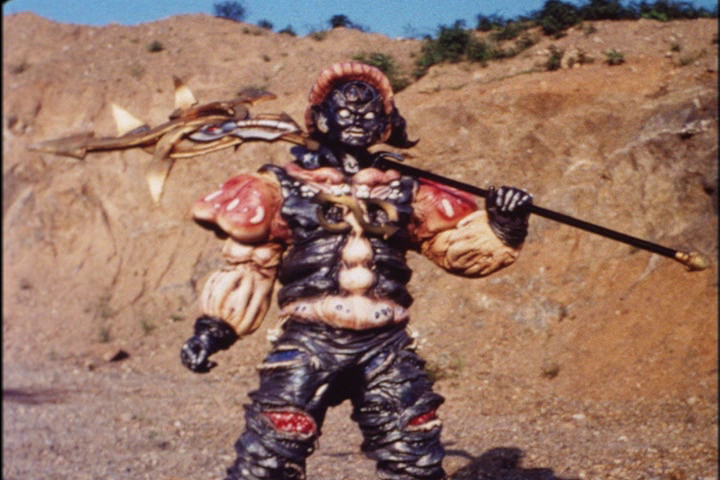 OK, so Karakasa has two forms and both of them are equally as stupid looking. In her normal Yokai form, she captures Saizo and Seikai (are you surprised it's those two?..........me neither) using a pair of outlandish dancing shoes. She doesn't do much of anything outside of present her captures to Daimaoh for his birthday. Even enlarged, she barely puts up a fight...especially after Daimaoh hilariously leaves her to die. 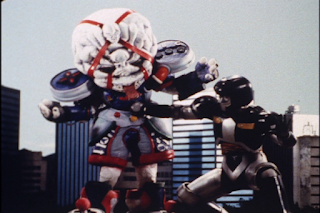 This is one of those weird situations where there is a terrible Yokai suit in an otherwise great episode. 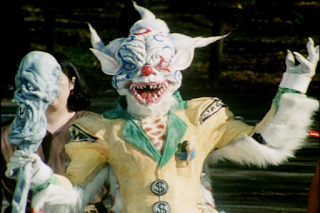 Maybe Binbogami wasn't the most original Yokai (Kyubi no Kitsune and Kanedama were both money-crazed Yokai who bilked people out of money), but did he have to look like a reject 80s horror movie clown to get his point across?? Blerg! Fun episode, but the costume design for Binbogami was awful. 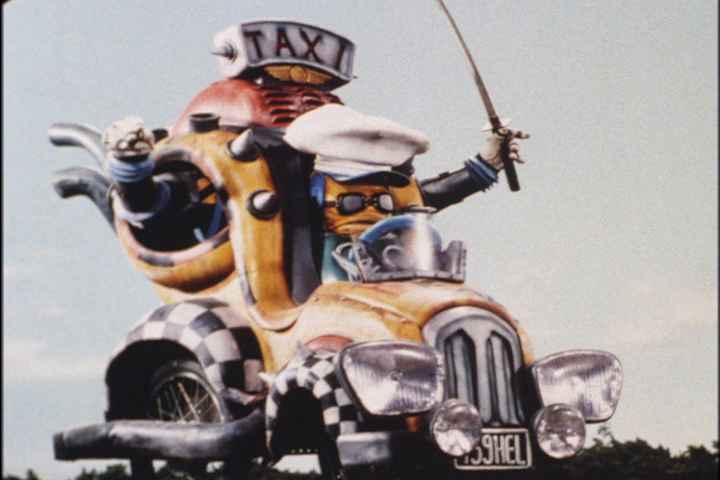 Again, this was a solid episode that happened to have a lousy Yokai design. An ice queen? Man, that's such a boring idea that even Disney wouldn't touch that with a ten-foot frozen pole. This episode mostly served as a Yugen Jikko Sisters Shushutorian reunion. It was fun enough, and served as some last minute Tsuruhime attention before Ninjaman's arrival in 36, but the Yokai was not at all necessary to the plot. So we got a melted-faced weasel in a bomber jacket. Who cares...it's Shushutorian! Zashiki-warashi is a child Yokai who Junior awakens to become a full-fledged terror. His innocent look was basically a child wearing a Halloween mask. 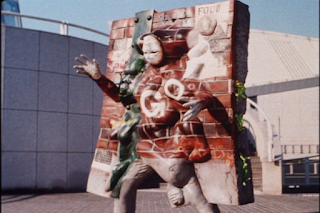 His awakened form resembles a Yogurt California Raisin with a funky pair of shoes and an inexplicable video game motif (whatever they did in the Power Ranger version of this episode probably made more sense...). This episode really could have been done well if the Zashiki-warashi designs were better. It set the stage for a personal grudge between Jiraiya and Junior that never really went anywhere. This one had potential all around...but fell short. Good grief. 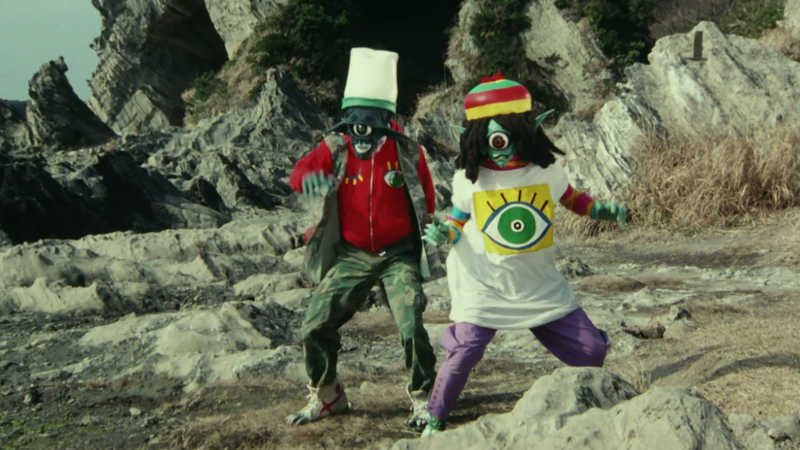 Well, my recent marathon of Kakuranger mercifully didn't include these guys. 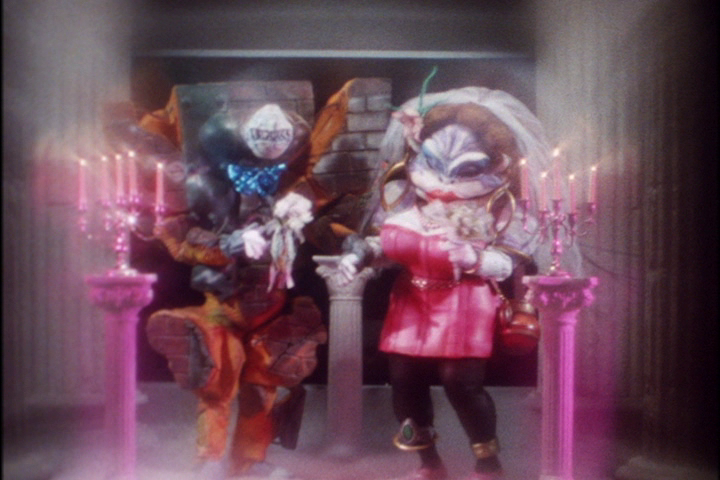 The Kakuranger movie is a rather bland affair featuring three Yokai--Oonyuudo, and the Hitotsume-kozo Kyodai. Now, I didn't mind the tuba-playing Oonyuudo that much, but the Hitotsume-kozo Kyodai are probably the laziest Yokai costumes of the entire series. The movie is a bit of a dud compared to the rest of the series...but it is worth seeing since it was shot with much better quality equipment and features stereo sound (yep, the series aired in MONO). I really, really didn't like episode 12. 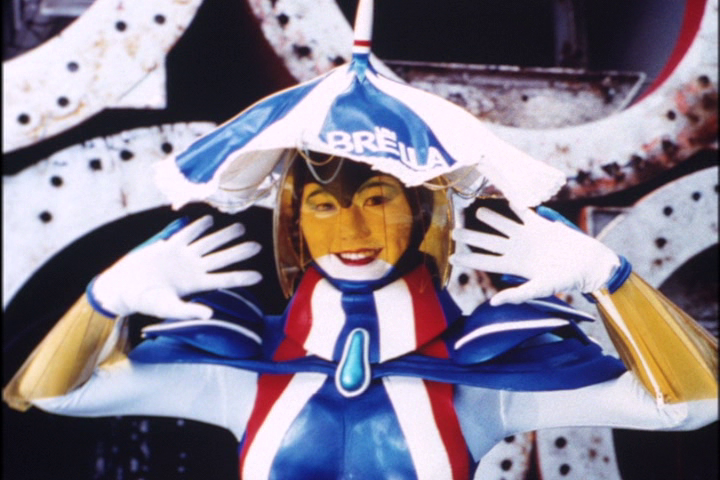 It was kind of a clip show without being a clip show...and all so they could introduce the Jusho Fighters, which are 100% pointless to the Sanshisho mecha plotline. 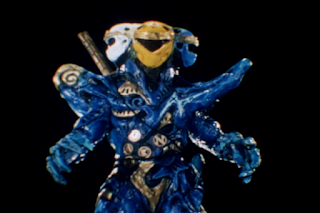 Not only is the Tengu suit just lousy to look at, he was given an absurdly stupid weakpoint just because the episode was so jam-packed that it just needed to end quickly. 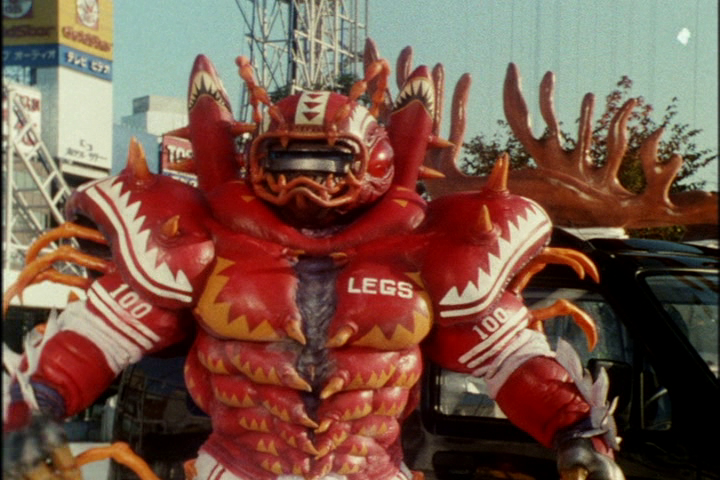 I would have to say that Kakuranger has some fairly conservative monster designs compared to the previous 90s series. 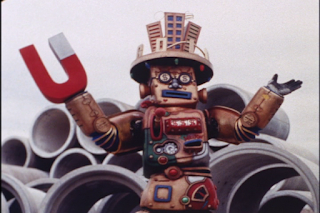 Oboroguruma is about as out there as Kakuranger got. While having a vehicle monster isn't an entirely original idea (see Kamen Rider BLACK RX), this is probably my favorite. BUUUU BUUUUUU! This episode was a little middle-of-the-road in terms of quality, but I love the Amanojaku suit and how he came to be. Amanojaku is one of the rare Yokai who wasn't dispatched by Daimaoh after his arrival, rather he tricked a boy into freeing him from captivity. There were a string of episodes toward the end of Kakuranger to show that the show was just as absurd as it was when it started. The Christmas episode is no exception. When we didn't get moments where Sasuke is legit trying to kill the real Santa Claus (who is invincible apparently...he takes quite a beating), we go Oomukade--the centipede themed American Football player. Football on Christmas? I swear that had to be intentional...and it isn't even a Jiraiya episode. 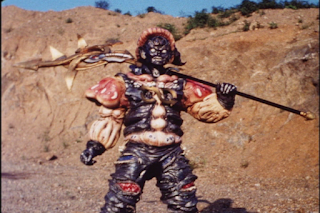 As crazy as it all is, I really enjoy the Oomukade design. 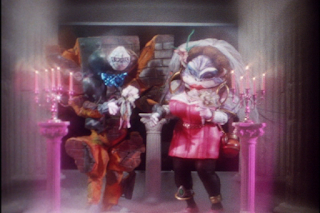 As I mentioned previously, Kanedama is an extortionist Yokai who is obsessed with money. His coins cause problems for people, who in turn hire him to lift the curse. I think the overgrown slot machine is a pretty hilarious design. Dollar signs for eyes?? Yes! On top of that, he takes quite a pummeling in the episode...which is pretty funny in it's own right. Like Oboroguruma, this is one of the original batch of Yokai that were so good that you see them several times in the series. I can't say much for his abilities, but he definitely has a great looking costume. On top of being a great stand-alone episode, I actually dig Amikiri for a couple of reasons. The first, obviously, is the suit design. I mean, a lot of work definitely went into that one. It looks fantastic. The second is her mission...which is one I kinda wish Kakuranger explored more than just once. Amikiri was obsessed with exacting revenge on Saizo despite never having interacted with him up to that point. Why was she after him? His ancestor cut off her arm. It made for a great episode. 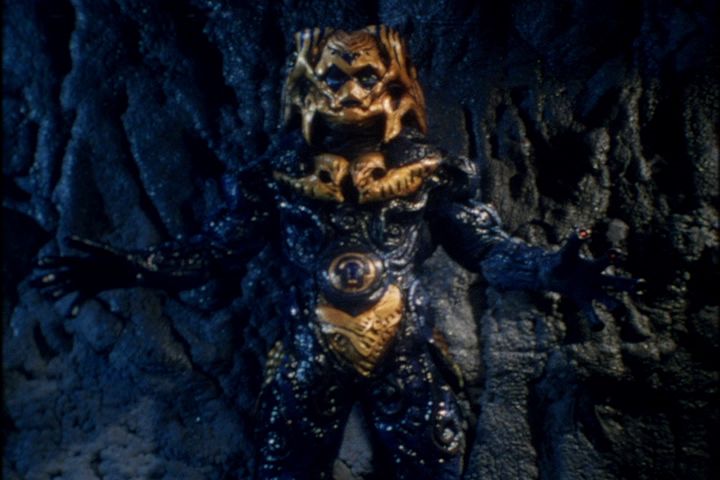 Daradara is the clone that Daimaoh created as part of his second to last push to kill off the Kakuranger. Call it the mini-finale. Daradara was able to steal the powers of and link itself to it's victim. First he drained Ninjaman, and finally Tsuruhime, Seikai, Saizo, and Jiraiya. Each time he linked himself, he gained these really gnarly bizarro physical features of his victims. It was a pretty genius plan to have a Yokai who would pass any damage on to the victims that he was linked to. Like I said, though...the demented Ninjaman and Kakuranger versions of Daradara is really cool looking. It was also a pretty spectacular set of episodes. So there are my lists of best and worst Yokai from Kakuranger. Did you love or hate any Yokai? Let me know! I'm on Twitter, or you can leave me a comment below if you have a Google account. Also, be sure to check out my other Top 7 lists. I will be back next time with a delayed entry in my CD Collection series. 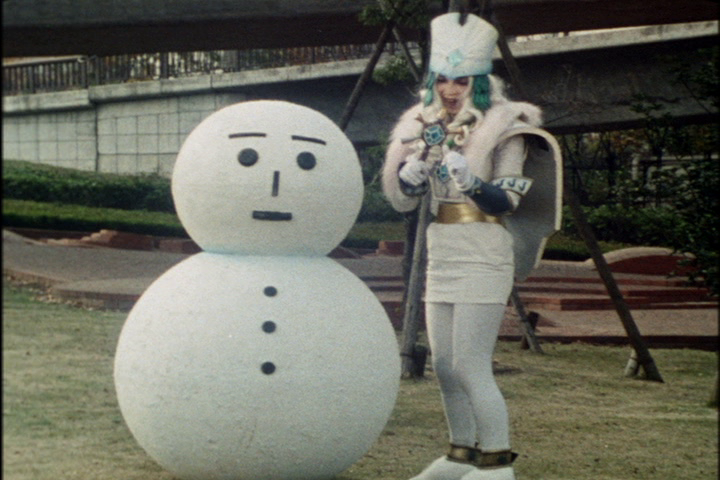 I really wanted to get this Kakuranger post up now while the DVD set is newly released. Be sure to get yours today! Thanks for stopping by...see you soon! Ninja de Gozaru! 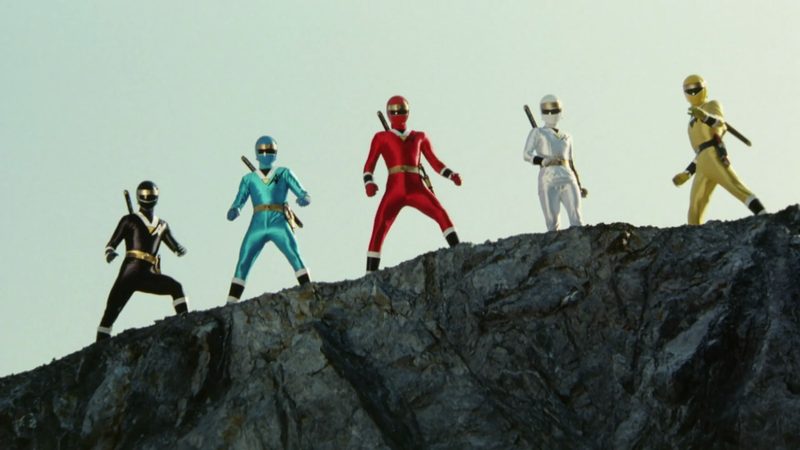 20 Years Of Kakuranger! Nice to see Top 7 List of your favorite sentai series, Kakuranger. Just in time for its DVD release, thanks to good ol’ Shout; which they also announced Ohranger DVD during Dairanger marathon! Regarding DVD itself, I find the cover bland compared to Zyu and Dai, where it had main cast; even the disc art use the same images. I’m also surprised that Ninjaman is nowhere to be seen on cover. Oh well. I like the choices you made for Worst and Best. Very interesting. 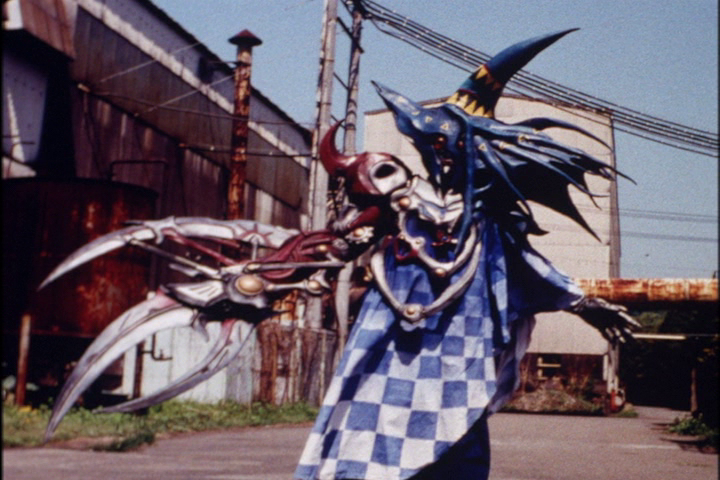 I think you might be the only person in the world who came up with best/worst list for MOTW (Yokai); not even Shougo B’Stard made a Worst/Best list for Changeman MOTW. Unlike most of your Top 7 lists, I really don’t have much to say, since it’s really hard for me to pick a favorite MOTW. 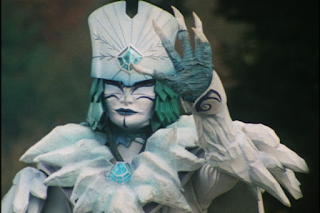 Karakasa may be the cheapest looking villain of the series IMO. Yuki-onna is probably the better design among the list IMO; she doesn’t look that BAD, but bit generic. Poor Kamaitachi. I think he could’ve worked in different episode or series. I like the way you described Zashiki-warashi. lol. Nice to see you mentioned movie. I think these guys would have worked better with Saizo and/or Seikai focus episode. Oboroguruma is such a bizarre design indeed. It would have been nice if it had one more “L” on license plate. I like Amanojaku design as well. I like his weapon too. 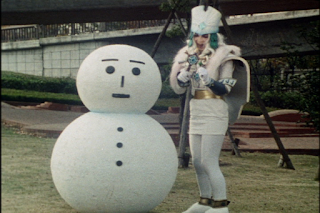 Oomukade would have worked well in football episode, but it’s such a bizarre to see it on Christmas episode. Still an awesome design. Slot machine design for Kanedama is quite original. 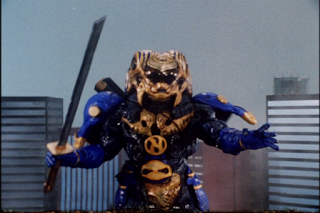 I wonder if this MOTW was inspiration for Ohranger’s Baranoia. Nurikabe has very nice design for both normal and battle mode. Amikiri design is so insane with so many blades, ready to slice you up! Interesting to see Daradara on #1. I wished that was that FINAL villain (or before final showdown) IMO. I don’t have worst list, but I do have best (not in specific order). Something I failed to mention (ehh whoops) is that I was excluding the main Yokai like Daimaoh and Gasha Dokuro. I don't really think Hana no Kunoichi Gumi can really fall into the Yokai category as they aren't actual Yokai. I would call them Yokai loyalists more than anything. Maybe an in-between thing like the "We're obsessed with Sasuke" Fan Club. 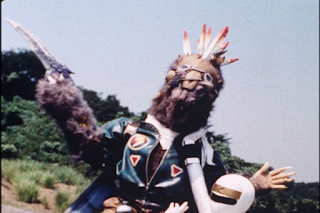 The Top 7 WORST Kamen Rider Henshin Belts!